Use GCC compiler in Termux? 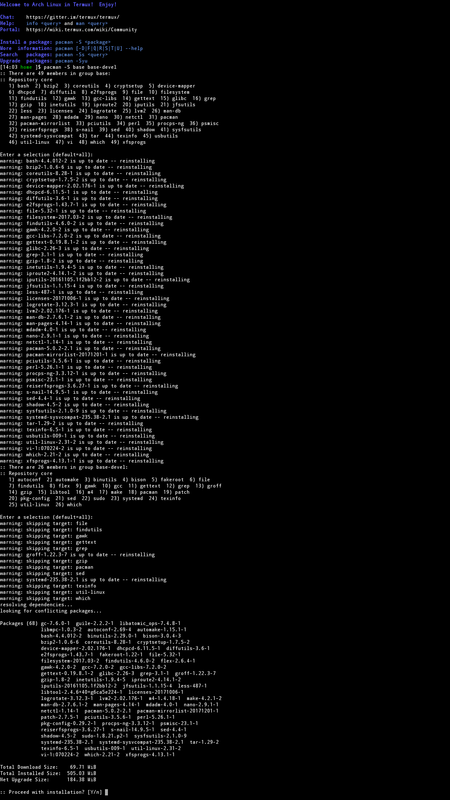 I don't like the default C compiler clang provided by Termux. Is there a way I can get GNU GCC in my Termux environment? Another way to get gcc would be to add the community repo hosted by its-pointless at https://github.com/its-pointless/its-pointless.github.io. Sources are (more or less) available at https://github.com/its-pointless/gcc_termux. Other popular packages available includes numpy and scipy. More information about this and other community repositories can be found in the termux wiki. First download GCC for C4droid from Google Play. Apply chmod -R 644 to the whole folder and chmod -R 755 to ARCH/bin, bin and libexec. Link gcc programs to $PREFIX/bin and you'll be able to use GCC instead of Clang. Remember to add -pie when compiling executables. Install Arch Linux in Termux PRoot to get a full Linux development environment. See https://sdrausty.github.io/TermuxArch/docs/install for installation instructions. Use pacman -S base base-devel to install the developer's environment which includes GCC. Not the answer you're looking for? Browse other questions tagged termux or ask your own question. Termux - How do I create a directory of files accessible outside of Termux? How to use tmux copy / paste in Termux? Why lsusb gets “permission denied” error in Termux?